Starz: Whatever your dream may be, always shoot for the STARZ! Welcome to the Starz website! Tuesday, May 7th - Starz & Angel @ The Courtyard Lounge, Englewood, Ohio - just north of Dayton ! 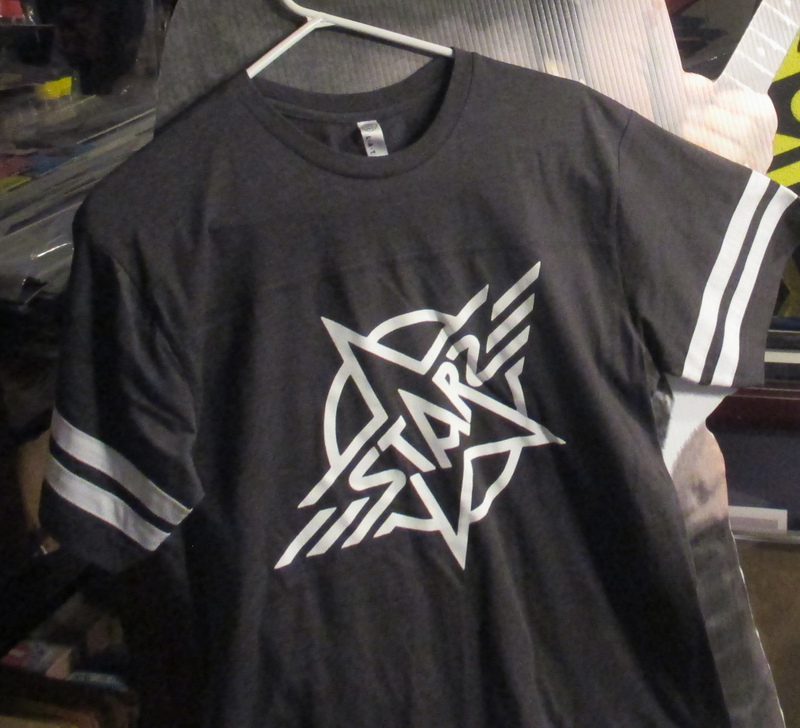 Short sleeved T-shirt jersey in smoke gray with white stripes on sleeves and white Starz logo. Available in Medium, Large & XL at $25 + $4 shipping in the US. 2XL is $28 + $4 shipping in the US. Shipping outside the US for Med & Lg sizes is $14 and for XL & 2XL it's $24. Payment can be made through Paypal to our account: starzcentral@erols.com. Please include SHIRT SIZE, NAME, ADDRESS & your EMAIL address. To make secure online purchases, check out the new RockWorldRocks! website for the coolest rock merchandise. You can also purchase the Starz "Unplugged" CD and Richie Ranno's new solo CD there! Richie Ranno's Live Performances !! Friday, Arpil 26th - Richie Ranno Solo Acoustic @ Ah Pizz, 615 Frank E. Rodgers Blvd South, Harrison, NJ 6 - 10 PM ! Saturday, April 27th - Billy Monroe & The Soul Survivors @ Duffy's, 856 River St, Paterson, NJ 9:30 PM - one block from Hawthorne ! See above - May 2nd through May 10th for STARZ SHOWS ! Saturday, May 25th - Richie Ranno's All-Stars featuring Joe Dube & George Vriones DiAna @ The Orange Lantern, Rt 17 North, Paramus, NJ 9 PM ! Watch This! - Check out this video for Kiss Me Deadly - Richie plays with Lita Ford, April 2010! Watch This! - Check out this video for Cherry Baby by STARZ! Watch This! - Check out this video for Pull the Plug by STARZ! Watch This! - Check out this video for Tear It Down by STARZ! STARZ, VIOLATION, ATTENTION SHOPPERS & COLISEUM ROCK remastered reissues! Each CD includes bonus tracks! !